Congratulations - a hat trick! You have now taught all three of our sons and all three passed first time. Well done, Bill Jones, and thank you." "You'd be certified MAD if you choose anyone other than College School of Motoring. They offer a high quality service at excellent value for money. David Wellbrook has all the qualities you'd want in a driving instructor, including patience and humour! I'm extremely grateful to have been given the opportunity to learn with this driving school." "Having tried various mainstream driving schools, failing twice and being very nervous, I decided to use what I believed to be a smaller company with excellent references. On March 22nd, I passed my test and would therefore like to thank David Wellbrook who put me at ease and convinced me that I was a good driver. I would recommend College School of Motoring to any learner driver. I am now looking forward to taking a Pass Plus Course." "Hoorah, I passed! David made it possible by making me feel confident in my driving and teaching me a lot during my lessons. He made it fun with his various jokes and experiences!! He is an all round top bloke!!!" My driving instructor, Neil, was extremely encouraging and was also diligent in noticing my mistakes which he corrected in a helpful manner. I believe it is due to his attitude that I was successful in passing my test first time!" "My driving instructor, David, helped me reach my goal of passing my test with confidence, by making sure that my driving was at a high standard throughout all of my lessons. He ensured that I had consistency and a good technique to my driving which enabled me to succeed in passing my test and to become a safe and confident driver." "I'd like to say a massive thank you to College School of Motoring! I never imagined that I'd pass first time, as I'm normally extremely nervous about these things, but with enjoyable lessons and a reassuring instructor, I passed first time! Thanks again to Neil, and I would encourage everyone to learn with College School of Motoring." "Thank you David for all your friendly and professional advice(s). What an achievement! I'm still over the moon enjoying my new-found freedom. I've already recommended College to two friends and I'm looking forward to my Pass Plus course. Thank you once again!!!" "I passed my driving test last Tuesday, and wanted to extend my thanks to my driving instructor, Neil Collins. "As an older learner, (I am 35), I was a little apprehensive about starting to learn so late in life. However, Neil's approach was fantastic - always patient, full of tips and advice, much of which was his own work, such as personalised maps and diagrams. I felt reassured and confident through the varying stages of my learning process, with each lesson being a steady build on my previous experience. I can honestly say that learning to drive was an unexpected pleasurable experience, and I would recommend Neil to anybody. I am sure they don't come any better." "After delaying learning to drive for years, I plucked up the courage and I'm so pleased I chose College. Passing my test just four months after I started lessons is one of my proudest achievements! I can't fault the service College provided - punctual, friendly and professional, and most importantly, patient and understanding. I'd recommend the driving school to anyone wanting to learn in the local area and will miss my driving lessons! Thank you! "Friendly company offering great instructors of high quality. Thoroughly enjoyed my driving experience and lessons. Many thanks." "After many years of on-off driving (with never having the confidence to take a test), and a fortune in wasted fees, I would like to say thank you to David Wellbrook, as I could not have passed without him! He had a calming influence that gave me confidence in my own ability along with a great method of helping with the Highway Code. I have recommended your school to others and hope that they go with you. Once again, a big thanks!" "Excellent! 100%. Recommend to anyone!" "Just want to thank Neil for all the help. He is a great teacher and without his help I would not have passed first time. I will be telling my friends to come to College School of Motoring. Thanks again." "I needed a quick driving test pass and found David Wellbrook to be a relaxed and patient teacher who helped take the pressure out of the situation. I passed first time with just three driver faults. I'd recommend David to any learner." "Thank you so much David for everything, I never imagined that learning to drive could turn out to be so enjoyable. Thanks for giving me confidence, helping me to work through all my nerves and pass first time! Thanks also for being so flexible with lesson times so I could work them around my work commitments, and for always being so helpful whenever I had questions. I haven't stopped smiling since I passed! I am truly grateful for everything, and look forward to furthering my skills with you on the pass plus course!" "Couldn't have chosen a better driving school to team up with! Very reliable and friendly. Passed my test first time within 2 months of starting! Ivor was a very patient and professional instructor and I now actually miss the lessons! Thanks for everything." "I'm so glad I chose College School of Motoring to teach me to drive. I was very nervous but Ivor Wilkinson's calm manner and humour soon made me relax and actually enjoy learning to drive. My instructor was always on time, his car clean and comfortable. I will definitely recommend College to all my friends!" "David, thank you for getting me though this hurdle in my life! You were the first instructor who had faith in me and told me EXACTLY what I needed to do to improve - that belief meant a lot. I'm hoping to make my inaugural trip to Bromley on my own very soon!" "I really enjoyed my driving lessons. My instructor, Neil, was really good and very easy to get on with. Every single lesson, he made me feel really relaxed which I think is very important. I actually miss my lessons now, but love driving on my own. College School of Motoring is very good and extremely efficient. I couldn't have done it without you. Thanks very much." "Thank you so much for your patient and professional tuition. I was in a panic and very nervous at the beginning but your help gave me confidence to pass first time in just two months. College School of Motoring will be top of my list when recommending to friends. Thanks a lot." "Really pleased with the quality of lessons. Neil is a superb instructor and have recommened him!" "I can't praise my driving instructor David enough. He was 100% professional and reliable, always turned up on time and answered any questions that I had. I was over the moon when I finally passed my driving test. I would definitely recommend your driving school to anyone I know who is wishing to learn to drive. Thank you again." "Learning to drive with College School of Motoring was a very enjoyable and worthwhile experience. My instructor, Neil Collins, was fantastic, keeping me relaxed whilst teaching to a high standard. There was a real sense of him wanting me to succeed. A friend of mine has already joined College for lessons based on my recommendation and I shall certainly continue to point people in the school's direction. The friendly, high standard of teaching helped me pass first time with just two minor faults. Many thanks to Neil and to College School of Motoring." "Every week I looked forward to my driving lessons with Neil, as each week I would pick up or improve on a different driving skill, whilst having laughs. Thanks to Neil, I passed first time. Thanks College!" "I am really pleased I chose to go through College School of Motoring. My instructor, David, was reliable, patient, positive and always happy and humourous. I have thoroughly enjoyed learning to drive with you. You have helped me achieve an ambition of mine which I was very nervous about and have taught me very valuable skills. Thanks very much David for putting me at ease and making me believe in myself." "College School of Motoring was the first driving school I contacted for a quote. David Wellbrook was so friendly and informative. College was the only school to send out an information booklet which I found extremely helpful. My boyfriend also had lessons with College a few years prior to me, and highly recommended them. Driving was a challenge, but my instructor Paul Durling, gave me confidence to pass first time. He was always very supportive, understanding and calm throughout my lessons. Thank you so much College! I will highly recommend you." "Thank you! Paul was a friendly, exuberant and vibrant instructor and was very easy to learn with. He was clear and thorough when discussing manoeuvres and driving in general, and gave me useful tips on how to improve my driving still further. I would highly recommend Paul Durling to any one of my friends." "I'd like to express my thanks to College School of Motoring, and in particular to David Wellbrook. He was very concerned with my progress and did everything to make sure I was a safe driver and would pass my practical test. He built my confidence and taught me dual skills of car control and how to deal with other drivers. I recommend College to everyone. Many thanks." "An excellent driving school that shows dedication to the success of the learner driver. My instructor, Neil Collins, was very encouraging and a joy to learn with." "Passing my driving test was a big achievement....I couldn't have done it without College School of Motoring. My instructor, Neil, was very supportive and helped me compose my nerves for the test. If I'd been as nervous as I usually am for tests, then I'm sure I'd have failed. Thank you Neil for ALL your help. I now intend to move on to Pass Plus and will definitely be recommending you to all my friends in the future." "Thank you, David, for helping me with my driving lessons. Your help has been important for me to pass my test, as you were the only instructor who actually told me where I was going wrong. Thank you! I would recommend your school to my friends and family." "Thank you very much for making learning to drive such an enjoyable experience. A course of lessons in a car that I really liked and an instructor I got on well with from the very first lesson right up to the last. And then my test....which I passed first time! I will recommend College School of Motoring to all my friends and anyone who is eager to learn to drive." "I recently passed my first driving test after completing a course of lessons with "College" instructor Neil Collins. He was excellent; all my questions were answered and I was taught in a very positive and safe manner. Neil kept good records to ensure I improved on my weaknesses and learnt new aspects of driving thoroughly. "College" as a school seemed efficient and helpful. I would certainly recommend both my instructor and the school for learner drivers. Many thanks! "I would like to say a huge thank you to my instructor Neil Collins who was absolutely fantastic. He taught me very effectively in a calm and supportive manner, guiding me to pass first time after only four months of lessons. A top sense of humour meant we shared many laughs along the way right up to my test, helping me keep relaxed on the day. Furthermore, Neil was very flexible and completely reliable, and topped with a great car to learn in. I was given the perfect start to my driving career. "Um...ah...what can I say? I had fun learning and passed my test!! What more do I need to say?" "I really enjoyed the experience of learning to drive with College. My instructor, Neil Collins, was very nice and he helped me to build my confidence. In the space of four months, I went from not even knowing how to put the key in the ignition to passing my test first time with only three minor faults! "After trying three other driving schools, I thought I would never find one which could put the fun back into driving! I enjoyed every lesson and David Wellbrook was very patient. The combination of all these positive aspects helped me achieve my goal of passing my test, and bonus!! I managed it first time." "I want to thank David Wellbrook for helping me pass my practical test first time. I had a short time to learn before my theory ran out and in that time you made me a driver! I will always be grateful to you and College School of Motoring." "My instructor, David, was professional, reliable, honest and sensitive. After having 3 previous instructors, it was important to me that my instructor was patient and that he put me at ease, and David did just that. I learnt a lot more than I had previously, and have already recommended your school to others. I passed my test having been properly prepared for every-day driving experiences. HIGHLY RECOMMENDED!" "I love driving in my car and it's all thanks to College School of Motoring that I have my licence. I was what you'd call a mature student and about to give up all hope of passing my test until I met David Wellbrook, who with skill and patience got me through it all, and managed to keep his sanity. Thank you once again." "Thank you in helping me pass my driving test. I really enjoyed the experience! I would also like to thank David Wellbrook for his time and flexibility which was a great help. Thanks once again." "I would like to say that my instructor Neil Collins was fantastic. His guidance and instruction was clear and his teaching methods concise and easy to follow. I would recommend College to anyone wanting to learn how to drive. They are well-equipped to help anyone pass their test as I am now the fourth member of my family to have passed with them. They are a proven success." I would like to thank you, David Wellbrook, for helping me pass first time. Thank you for taking me on at such a short notice. I am glad I chose to use the best driving school. I will definitely recommend COLLEGE SCHOOL OF MOTORING." "I found out about College through a friend, and from day one I knew they were different. As soon as I rang up they were helpful and friendly. My instructor, Ivor Wilkinson, kept me keen and motivated helping me to pass my test just four weeks after my 17th birthday. College's rates are very competitive given the quality of instruction on offer. All I can say is a big thanks to all the College team that made my pass possible. Cheers!" "Learning to drive with David Wellbrook and College School of Motoring was a joy from start to finish. Not only that but they give you a realistic idea of how many lessons you are likely to need, rather than encouraging you to waste money on unnecessary tuition. Competitively priced! Would recommend to anyone." "I found your school by lucky chance via the internet. My instructor, Neil Collins, was supportive throughout and we managed some laughs along the way! Thank you for helping to ease the process of learning!" "You have taught me well and got me on the road in less than three months. The way I was taught was clear and simple making it easy to learn. I also liked the way that I was taught in a relaxed and friendly manner so that I didn't feel nervous. Most of all, the instructor was friendly and bent over backwards to fit me in at the time that I required. So once again, thank you College School of Motoring, and most of all, thank you David Wellbrook." "Ivor Wilkinson was a great driving instructor. I enjoyed my lessons and he was excellent at explaining things in an easy-to-understand way and had a great sense of humour. I passed my test first time and am very grateful for all Ivor's help." "Learning to drive with College School of Motoring was a fun and enjoyable experience. Continuing support and guidance from my instructor, Neil Collins, put me at ease during my first few lessons and in the run-up to my test date." "I had spent a year, three test attempts and a lot of money on driving lessons, where the instructors were purely focussed on the test, rather than teaching me how to be confident and safe by being in control of a car. Neil Collins was absolutely fundamental to both getting me through the test and giving me a framework for safe driving. I can't praise him and College highly enough! After passing the test, I also completed the Pass Plus course, where again Neil was exceptional in his approach to giving me driving skills for life". 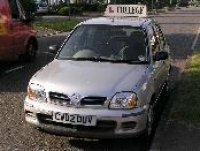 "I had been having driving lessons for about a year with another instructor, I failed my test twice, and then a friend recommended College School of Motoring. Within six weeks, I'd passed my test. David was a great instructor, very patient and friendly. College are good value for money aswell. Thank you College School of Motoring!" "Thank you very much College School of Motoring. You helped me pass my driving test first time with only one minor fault in just three months. My instructor, Ivor Wilkinson, was very patient and reliable. I would recommend College to anyone." "I've been trying to think of something to say about David for over two months now and I've finally realised I can't because I'm still flabbergasted by his amazing teaching!" "After only driving for five months, I didn't expect to pass my test first time with no minor faults!!! Thank you so much Paul Durling. Your reliable and friendly service put me at ease straight away. Highly recommended." "I found my time spent with David Wellbrook at College School of Motoring enjoyable, worthwhile, and most of all successful. The teaching methods were precise, easy to understand and all aspects of my learning experience were styled to ensure that I was comfortable, informed and happy. I would recommend College School of Motoring for the above reasons. I am happily now a qualified driver and intend to take further training with a Pass Plus course." "David Wellbrook was a good person to learn with. Very easy to understand with precise working methods. Thanks for everything. It was all great fun!" "During my lessons with College School of Motoring, I found David Wellbrook to be very patient, not pressurising me beyond my capabilities, allowing me to make good progress gaining the driving skills and knowledge to enable me to pass my test first time, in only 5 months. Thanks again." "I would like to thank Neil Collins for guiding me through the six months leading up to my driving test. His teaching was of a very high standard and he's a really great guy too! The quality of the tuition was higher than at my previous driving school, and I found the 80 minute lessons a great help as you have more time to find a rhythm. Thanks to Neil for all his help and support - it was top class, and the great car helped too!" "College School of Motoring gave been a great help whilst learning to drive. I was really pleased with my instructor Neil Collins, as he was very supportive and flexible with lesson times and days. I could only have lessons at weekends and the price did not go up as with many other schools. On the day of my test I was really nervous, but Neil put me at ease by going over everything he had taught me so that it was fresh in my mind. I could not have asked for a better instructor, and I would recommend College to anyone looking for great value for money." "College School of Motoring is a fantastic driving school. My instructor, Neil Collins, was flexible, patient and accomodating, picking me up from school and fitting me in at the last minute as my test approached. Eighty minute lessons were a great idea, allowing me to learn new topics whilst still practicing others." "I really enjoyed my driving lessons with Ivor Wilkinson. He made me feel confident, calm and in control of the car so that I never felt nervous when on the road. He was also very patient with me over my parking difficulties and I am now looking forward to taking a Pass Plus course to improve my driving and lower my insurance." "I tried three different motoring schools and College was definitely the best. My instructor, Paul Durling, was very friendly and really helpful. He made sure I was perfect for the test and it only took a few lessons. It was definitely worth the money. THANK YOU! "Paul Durling from College School of Motoring provided a professional and enjoyable experience in the run up to my driving test. It came as no surprise to learn of their very high pass rates as they knew exactly was expected on the big day. For perfect preparation and the best chance of passing your test first time, choose College School of Motoring. Highly recommended!" "After having many lessons with another instructor, I immediately noticed that the teaching methods and level of service offered was 100% better. THANK YOU!" "What can I say except BRILLIANT! The instructors are very patient, and willing to help when you find something difficult. They will always make sure you understand the manouevres and feel comfortable to do it yourself. By the time I took my test I felt totally confident as my instructor was kind, fun and patient"
"A well-structured course that takes you step by step at a reasonable speed to make sure you pass the test first time." "A relaxed approach to driving instruction, with a pace set at an early stage and tailored to the individual pupil's needs. Our instructor, David Wellbrook, was always prompt with his timekeeping and the 80-minute lesson provided a sound learning environment where aspects could be covered two or three times in one "drive" and so quell any anxieties that a nervous pupil may, involuntarily, carry forward to the next lesson. Both my son and daughter passed the practical test with "College" without difficulty - and no additional instruction, professional or otherwise, was required. WHY COLLEGE? WHY ANYBODY ELSE?" " Excellent instruction, smart cars and helpful, professional people - it's very easy to recommend College School of Motoring to everybody. Thanks guys!" "I can't recommend College School of Motoring highly enough. ..Having two children I found my instructor Chris Strong was really accomodating in juggling my lessons to fit my hectic lifestyle! It was a pleasure learning to drive and I almost miss the lessons! Thank you - you have changed my life." " Top notch instructing from Graham Leverton - a top notch instructor. I THOROUGHLY recommend College to anyone and everyone who wants to learn how to DRIVE, not just pass the test. Amazing. Thanks guys!!" "My instructor, Neil Collins, had loads of patience, a sense of humour and a very positive attitude. He made it fun!" "Learning to drive with David Wellbrook from College School of Motoring was an enjoyable experience. I was quite nervous when I first started but now I have the confidence and ability to be a good driver. Anyone who is looking for a friendly, patient, calm approach to teaching, should book their lessons with College School of Motoring." "David Wellbrook from College School of Motoring taught me to drive. He was professional yet very friendly and put me at ease from my first lesson. David was very patient with me, giving me suggestions for correcting any faults that I made without making me feel stupid. I found him very flexible when booking lessons, always fitting me in when it suited me. Best of all, I passed first time!" " I was very happy learning with College School of Motoring. I felt that I was taught by Paul Durling to be the "perfect" driver so that I would have a very safe and enjoyable time in the future. Thank you." "Before receiving driving lessons with College School of Motoring, I was one and a half weeks away from my test. I am relieved to say that without the help of David Wellbrook and College I would not have passed. I am glad I chose to use the best driving school when I needed it the most." "I found Paul Durling and College School of Motoring very easy to work with, and thought the 80-minute lessons were a suitable amount of time (at approximately twice the length of the driving test) to practise driving as a learner. I particularly appreciated having the benefit of being able to drive home from my College during several of my lessons, as these will be the roads I will drive on most in the next few months. Finally, I believe College School of Motoring is excellent value for money and I am grateful I passed first time!" "I found my instructor to be really patient. He was also very encouraging which gave me confidence to pass my test first time." "Thanks ever so much for making learning to drive so enjoyable. If I'm honest I thought it would be a chore but with my instructor's sense of humour and the help that I encountered when booking lessons, I enjoyed every minute. Thanks again." "A course of lessons in a car I really liked, an instructor I got on well with and an information package that was extremely helpful. I passed my test in 3 months. All in all, a great 17th birthday present!" "A reliable, punctual service with an excellent, patient instructor. Initial lesson indicated approximate number of lessons to pass - and it worked!" "I enjoyed very much passing with College School of Motoring. The staff were prompt and professional and my instructor Chris Strong was calm and helpful, getting me through the most stressful parts leading up to the test. I enjoyed the whole experiencevery much and would recommend College School of Motoring to everyone." "Driving with David is much like finding goldfish when in a treehouse". "I hadn't dreamt learning to drive would be so enjoyable. I wouldn't say I was a natural driver but my instructor gave me the confidence to make progress. To get my licence in just over two weeks was wonderful." "I found learning to drive with College School of Motoring a very informative and enjoyable experience. I was quite nervous in the beginning but my instructor put me at ease straight away with his friendly and calm approach to teaching. College School of Motoring came highly recommended and I would like to pass this information on to anyone who is eager to learn to drive!"